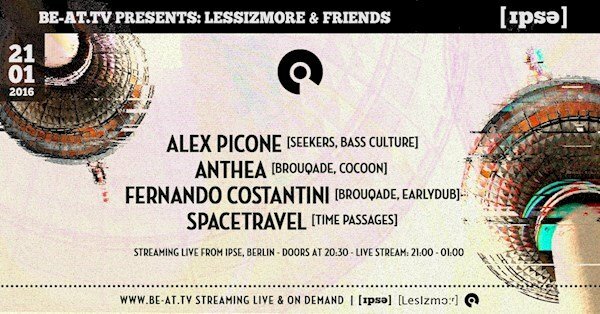 This event "BE-AT.TV Presents: Lessizmore & Friends" @ Ipse has already ended on 01/21/2016. Here you can find upcoming events for this location! This week the focus is on booking and promotion agency (as well as a record label), Lessizmore. Created by Fuse resident DJ Pierre and Jessica Bossuyt back in October 2005 the collective are well known for their quality techno parties across Europe and a slew of great record releases from San Proper, Frivolous, Robag Wruhme and more. 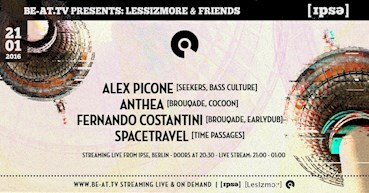 This time around, they invite two staples of the agency; Italian born, Berlin-based, Alex Picone and stripped-back, minimal house producer, Fernando Costantini. Playing alongside are two long-standing friends and affiliates; the inimitable Anthea and Spacetravel - the new soundscape project from Luca Cara. This is a private party. There is limited guest list. Please sign up below if you would like to attend.